Processes are important to everyday business. But sometimes, processes can hinder potential. If you’re stuck doing repetitive task after repetitive task, when will you ever have time to experiment, improve, or innovate? With our workflow automation services, we’ll help you do less and accomplish more. Let us automate your daily processes, tasks, and notifications, and as a result, save you time, reduce costs, and eliminate human error. It’s all about creating opportunities by changing the way you work. Automate processes and remove the human element from the equation. Make fewer mistakes and maintain consistency. Take repetitive tasks and processes and transform them into simple automations. Save time and reduce hassle. Customize your technology with automated alerts and always know what’s going on inside your business. At the end of the day, workflow automation exists to help you grow your business. With more time and greater consistency, your team will have the necessary elements to innovate and evolve your business into something better. Eliminate repetitive tasks and manual processes and start thinking strategically. If you want to go above and beyond workflow automation, take a look at our software development services. Whether it’s a mobile application, software integration, or something completely new, we have you covered. 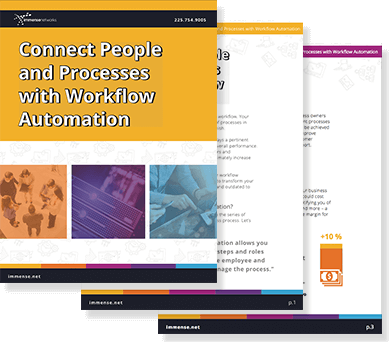 Discover how easy it is to optimize and streamline your processes with workflow automation. Do you have questions about workflow automation?